Our affordable mailing systems eliminate the time wasted on folding, stuffing and sealing of one-page documents into envelopes. Print & Mail pressure seal technology is simple and easy to use with almost any business application. Our Print & Mail solutions streamline your mailings such as invoices, notices, checks and more. Just print, fold and seal. That's all there is to it! No more paper cuts, licking envelopes, messy sponges, or water applicators to seal envelopes. No more envelopes to buy, lug around or store. Print & Mail pressure seal technology replaces both the envelope and the paper used with conventional mailings and can reduce your mail preparation costs up to 50%! * Print, fold, and seal at speeds from 1,800 per hour to over 10,000 per hour. Eliminate the time wasted on folding, stuffing and sealing envelopes. Our simple and affordable solutions work with almost any software application to process your checks, direct deposit advices, W-2 forms, bills, statements, notices or any one-page document. No more costly manual handling of checks, notices, tax forms, etc. Print & Mail pressure seal forms are available in different styles to meet a wide variety of office mailings. Standard "ready to ship" stock forms are available for use with common accounting software or you can have them personalized for your specific business needs. 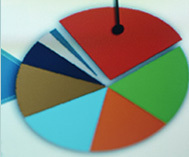 Print & Mail pressure seal equipment may also be used as a paper folder for most conventional office mailings. Use Print & Mail for one way mailings; two way mailings; or mailings requiring remittance stubs, return envelopes, coupons, ID cards, decals and more. Commander will provide the tools to help you customize the Print & Mail system to your individual business needs for almost any software program. Solutions are available for Windows and non-Windows based software applications to assist you with formatting your printed data to work with the Print & Mail forms. *Estimates: your actual costs may vary. Calculations derived from comparing the cost of preparing 1000 mailers using manual folding and inserting, out-sourced folding and inserting, and pressure seal equipment.